Our wonderfully funny friend and neighbor Sharron, who subscribes to my blog (Hi Sharron, we love you! 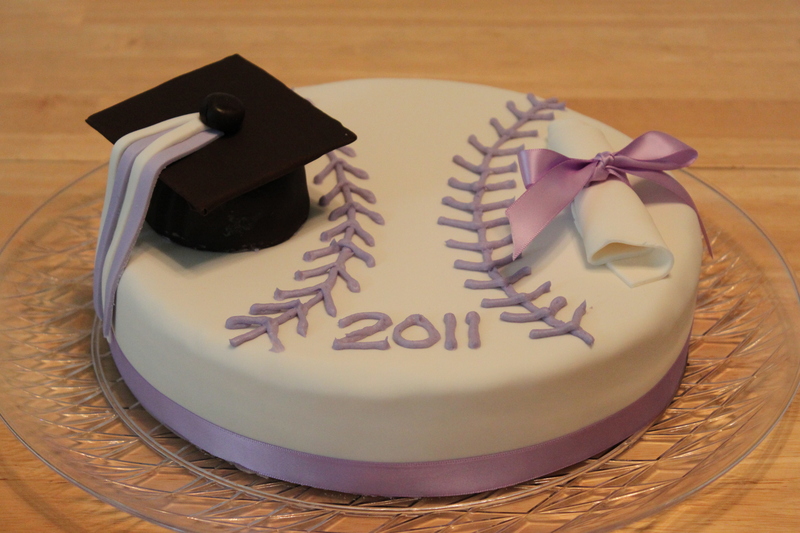 ), called and asked if we could make a graduation cake for her granddaughter Andrea who played softball in high school and is going on to play softball in college so we made her a softball graduation cake. The cake is the Chocolate Better Than _ _ _ Cake (which is under the blog as “Chocolate Better Than _ _ _ Cake with Penuche Frosting”) with Vanilla Buttercream Frosting and Satin Ice Buttercream Fondant. The little graduation cap is actually a chocolate chocolate chip muffin (under the blog as “Triple Chocolate To Live For Muffins”) with the top cut off and then covered with frosting and chocolate fondant. The mortarboard for the cap is a piece of cardboard covered in chocolate fondant. We tinted the frosting purple and Courtney piped it onto the cake in a softball pattern and she also did the “2011”. The diploma is a piece of the buttercream fondant rolled into a scroll. Happy Graduation Andrea!